Nourish and nurture your hands with Panier des Sens The Essentials Relaxing Lavender Hand Cream, a delicately scented hand treatment specially formulated for the most sensitive skin. Made with 20% Shea Butter, the ultra-nourishing hand cream melts quickly into skin, leaving hands feeling soft, supple and beautiful. 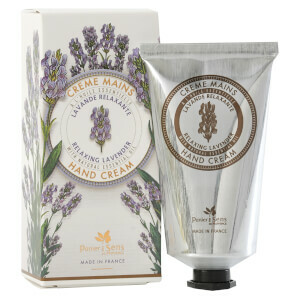 Infused with Lavender Essential Oil which has relaxing, soothing and antiseptic benefits. Free from parabens, phenoxyethanol, silicone and aluminium. Not tested on animals. Dermatologically tested. Apply regularly from fingertips to wrists. Aqua (Water), Butyrospermum Parkii (Shea) Butter, Glycerin, Propylene Glycol, Cetearyl Alcohol, Olea Europaea (Olive) Fruit Oil, Glyceryl Stearate, Peg-100 Stearate, Ceteareth-33, Talc, Lavandula Angustifolia (Lavender) Oil, Parfum (Fragrance), Xanthan Gum, Polyacrylamide, Caprylyl Glycol, Chlorphenesin, C13-14 Isoparaffin, Ethylhexylglycerin, Allantoin, Laureth-7, Tocopheryl Acetate, Citric Acid, Sodium Hydroxide, Tocopherol.